Lighting by Hammerworks handcrafted Colonial Onion Ceiling Lanterns add Cape Cod charm & style wherever you place them. While we show the Model OCL108 here these Colonial Hanging Lights are available in three other sizes. 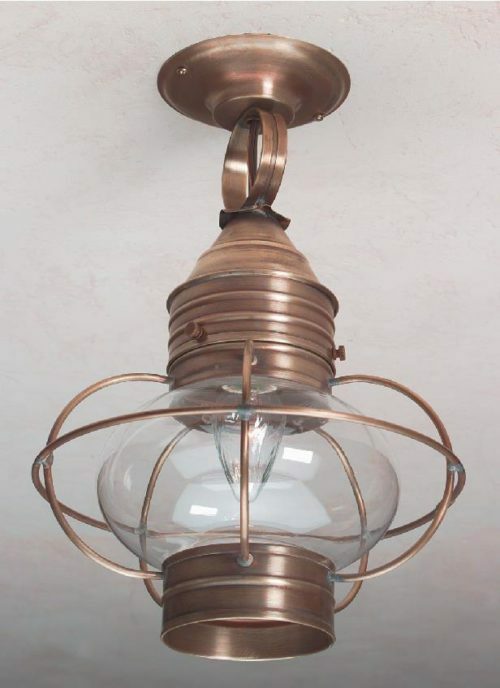 In addition to the ceiling mounted versions we also make Copper Hanging Onion Lights HOL110. Thus no matter what your ceiling height is we offer the right Colonial Onion Ceiling Lanterns to meet your needs. Furthermore you can choose from either antique copper, verdigris copper or antique brass finish options. Additionally on the larger sizes we offer an optional candle light cluster in place of the standard single bulb shining down. Because all of our Colonial Onion Ceiling Lanterns coordinate with corresponding post & wall lights you can create a uniform look. 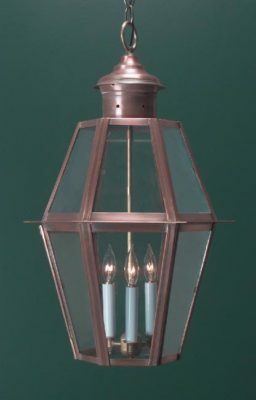 Therefore you will find Colonial Post Onion Lantern POL12 within our selection of Colonial Post Lanterns. This classic onion post light is available in two sizes. 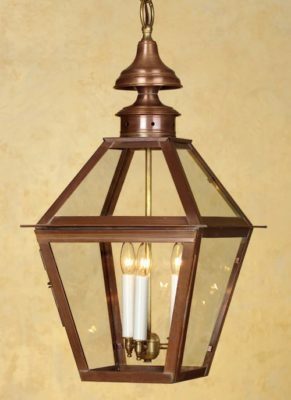 Furthermore we make several sizes and styles of Colonial Onion Wall Lights. Consequently you can create an overall effect of classic harmony when you choose Colonial Onion Lights. Although Colonial Onion Ceiling Lanterns are intended primarily for your homes’ exterior their uses extend inside as well. First of all, many customers choose to place something like Copper Hanging Onion Lantern HRG12 in the front hallway entry. Not only that onion lights make attractive kitchen pendant lights. Simply group together 2 or 3 of them over a kitchen counter or island. In addition, with so many sizes and styles to choose from they are easily integrated throughout a kitchen, dining, great room area. Of course if you prefer to mix and match your lighting, you can choose one of our many antique chandelier or ceiling light styles to coordinate with hanging lanterns. Consequently we offer a solution to any area in your home that requires overhead lighting.